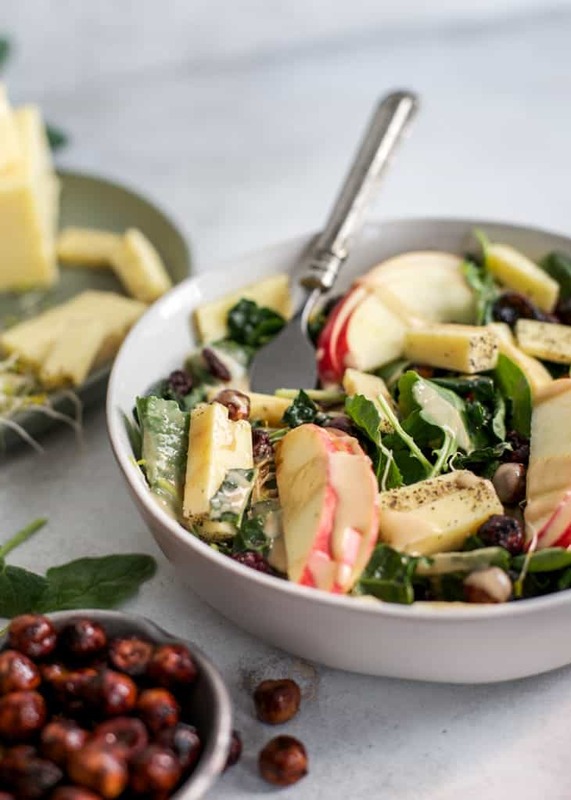 Trust me when I say black peppered white cheddar will be your new favorite thing, but especially on top of this Apple Hazelnut Kale salad. Using Tillamook Sharp White Cheddar because it is AH-mazing. This post is sponsored in partnership with Tillamook. As always all opinions expressed are my own. 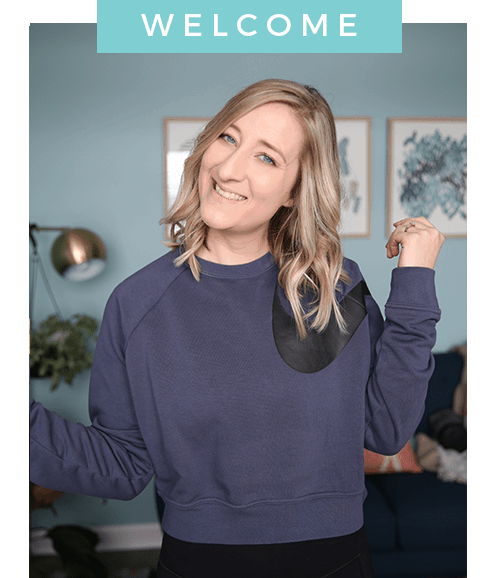 I only partner with brands I trust – thank you for supporting Fit Mitten Kitchen! 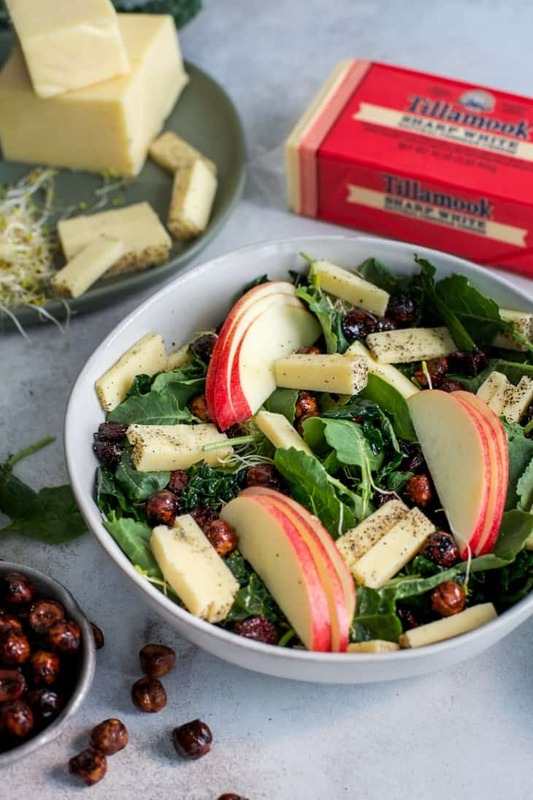 But before we get to this northwest inspired kale salad I MUST tell you about the most amazing trip I just took with Tillamook – the farmer-owned dairy co-op based in Oregon. 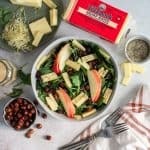 You may remember that “LegenDairy Weekend” I had back in April with Tillamook and Kroger, celebrating Tillamook products coming to the east coast. If you’re west coast based you already know how awesome Tillamook dairy products are. But if you’re in the Midwest and on the East Coast, you guys are in for a real treat! I’m so excited Tillamook is finally coming our way. If you follow me on Instagram, you know I’ve been partnering with Tillamook all year sharing their amazing products. 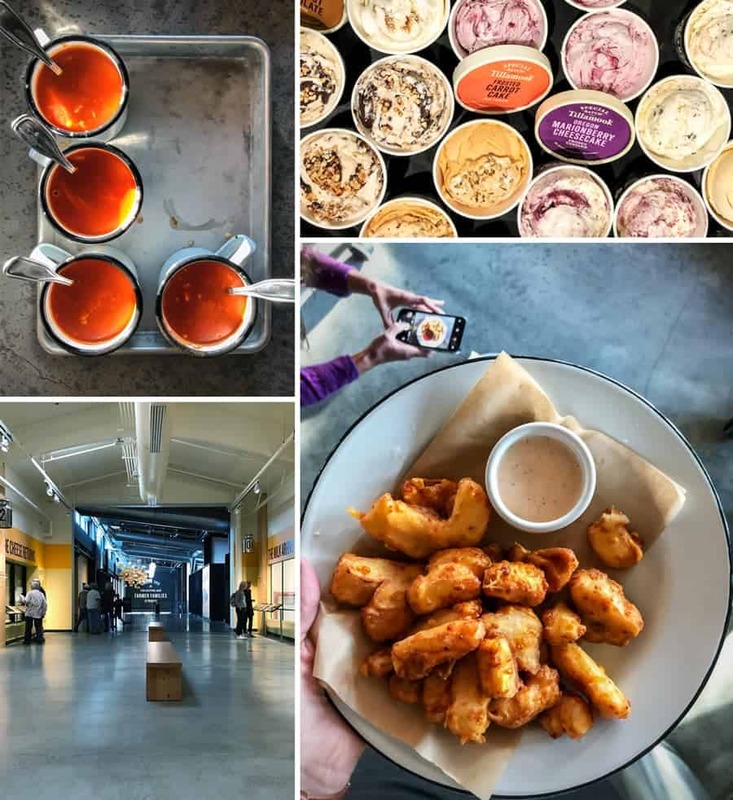 Earlier this month I had the opportunity to travel with six other bloggers to the Tillamook Outpost in Portland, stay on the Oregon coast in Pacific City and visit one of Tillamook’s dairy farms in Tillamook, Oregon (YES – it is a place too!). 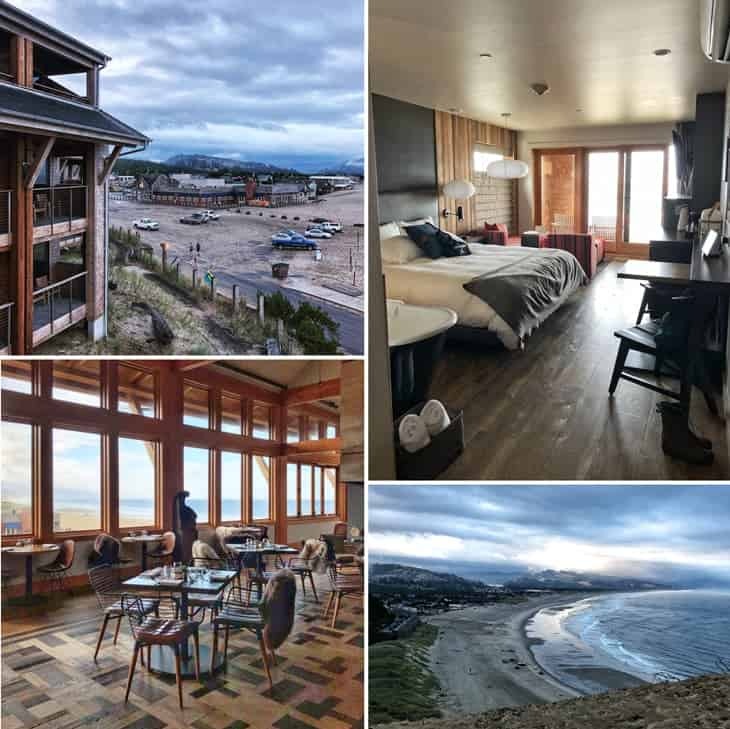 Once we all arrived into Portland we took a bus up to the Oregon coast, where we stayed at the Headlands Lodge in Pacific City. It was easily one of the most beautiful places I have stayed in. The views were stunning all around and honestly I had a hard time leaving my room – it was that cozy! Not to mention the little tub you could relax in with views of the ocean just outside your balcony. 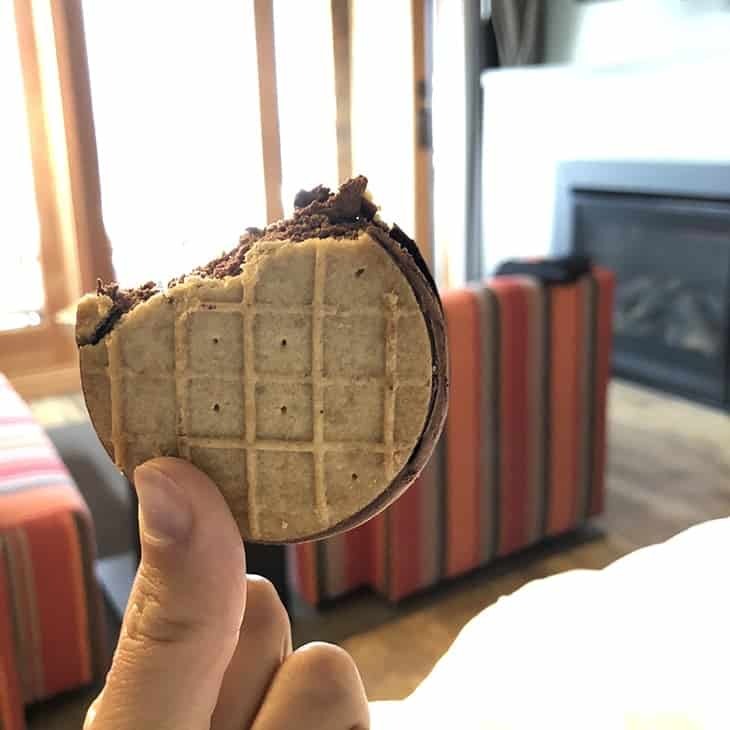 They even had a 24/7 Pantry where you could get local treats – obviously Tillamook Ice Cream Waffle Cone Sandwiches were a must during our stay. Visiting the farm we got a firsthand look at what goes into keeping the cow’s safe, happy and healthy. 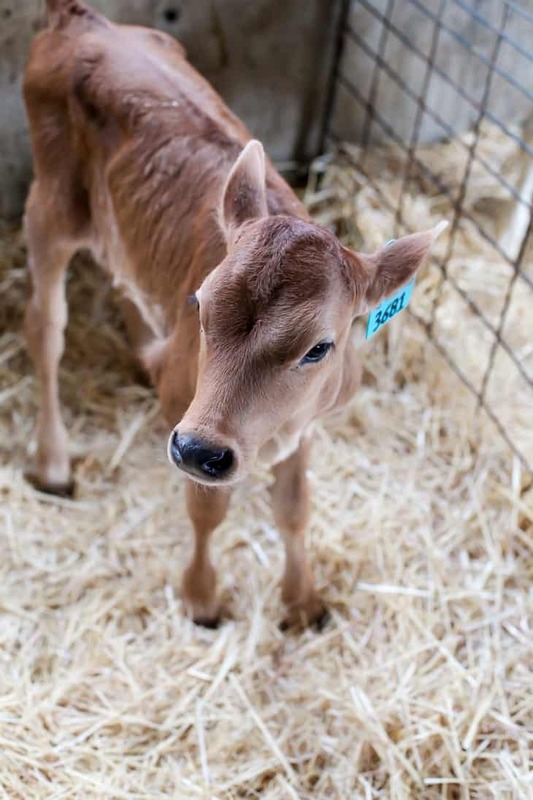 Tillamook farms have veterinarians that tend to the cows, making sure the cows are at their best. You can tell the farmers and the entire team really care about their cows – happy and healthy cows produce a higher quality milk so it’s pertinent to the entire production that the cows are being properly care for. I haven’t been to a dairy farm since elementary school but you could tell so much as changed with technology. The farm we visited was one of nine Tillamook farms in the country that uses a robotic feeder to help mix the feed for the cows. 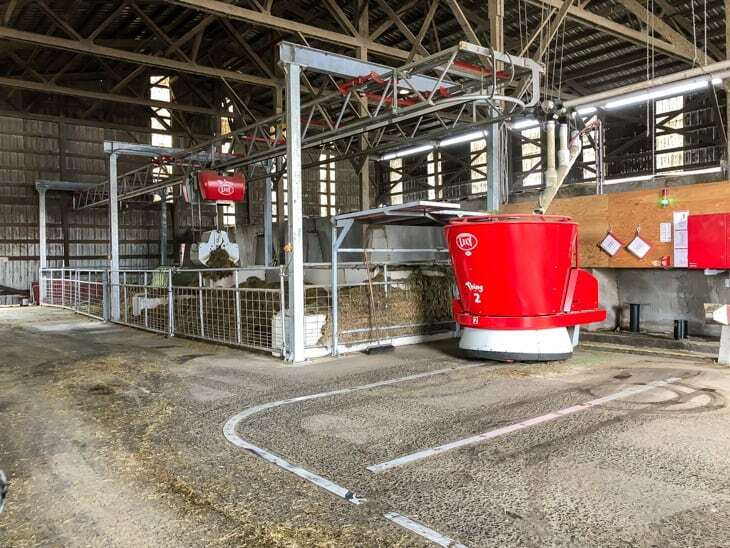 The robot automatically distributes the feed and is very accurate with how much is actually needed for each herd – so it prevents over-feeding and there is less waste. 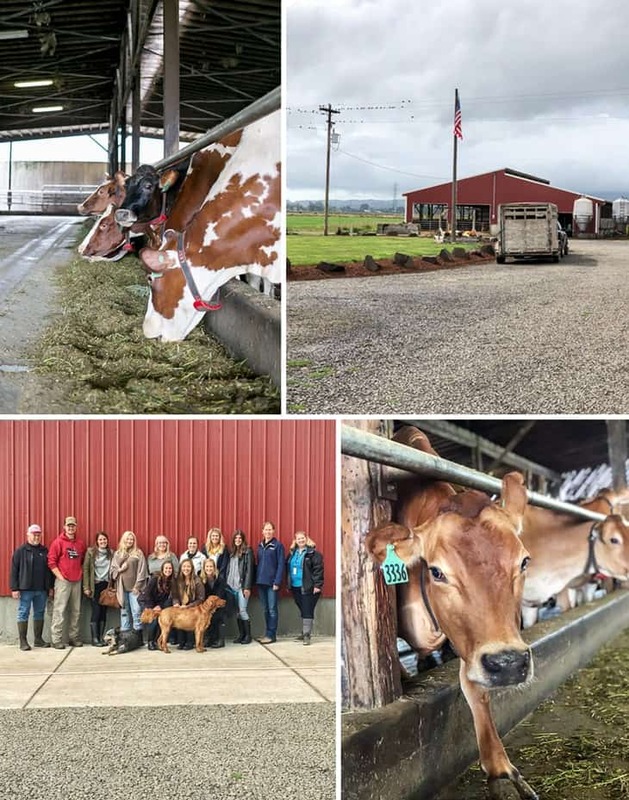 Side note: I highly encourage you to read: “What Makes Tillamook’s Co-Op Special, As Told By Our Farmers” to get an inside look at the Tillamook Co-Op. 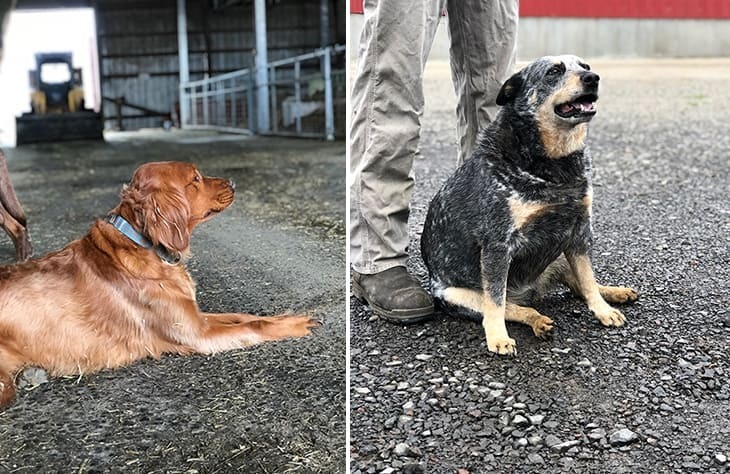 And I couldn’t talk about the farm without sharing a cute picture of their farm dogs – they did the whole tour with us. So cute. 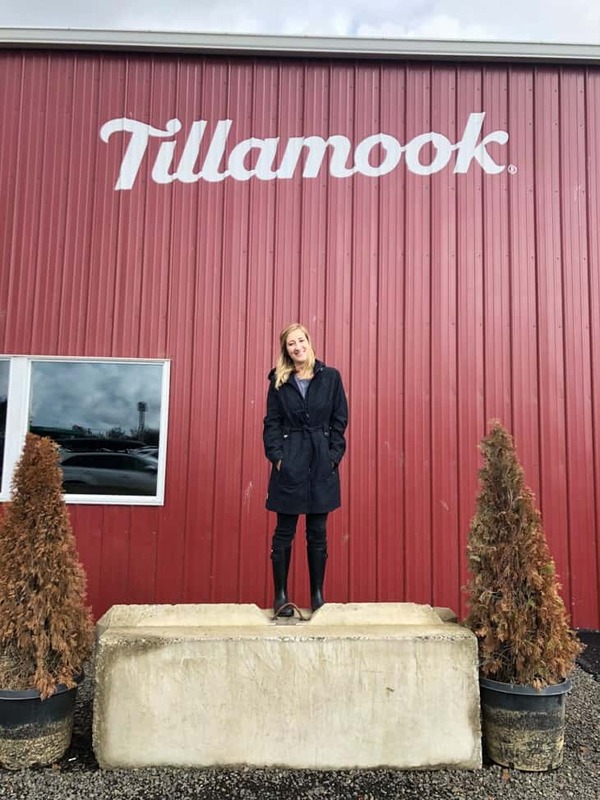 After visiting the farm we stopped at the Tillamook Creamery – newly remodeled and the perfect place to visit if you’re near the Oregon coast. We went through the whole tour and then had a little cheese tasting session with Jill Allen –Tillamook’s Director of Research & Development. Jill was also in Detroit during the LegenDairyWeekend as well. What most stuck out to me during this this session was the fact that not all cheese is created equal. It’s kind of a “duh”, I know. But when you learn Tillamook has extremely high standards for their cheese recipe, you start to understand the difference between Tillamook and other brands. For example, Jill explained to us, “the only age statement that stands for Cheddar is when it is heat shocked, then it must be held for a minimum of 60 days. 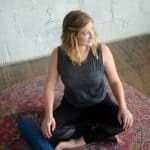 But in general, there is no standard of identity for law of what can be called Medium, Sharp or Extra Sharp.” So, while other brands are rapidly aging their products at a higher temp, Tillamook naturally ages their cheese at 42ºF – they don’t use an artificial process to speed things up. Tillamook is also known for their award-winning cheese. And the same cheese recipe that wins awards is the exact same recipe you buy in the store – pretty cool, right?? And that brings me to this kale salad with Tillamook Sharp White Cheddar. At the Creamery we got to sample from the menu and they had this Northwest salad with Smoked Black Pepper White Cheddar. The combo was pretty delicious and I had to make a rendition for you guys! 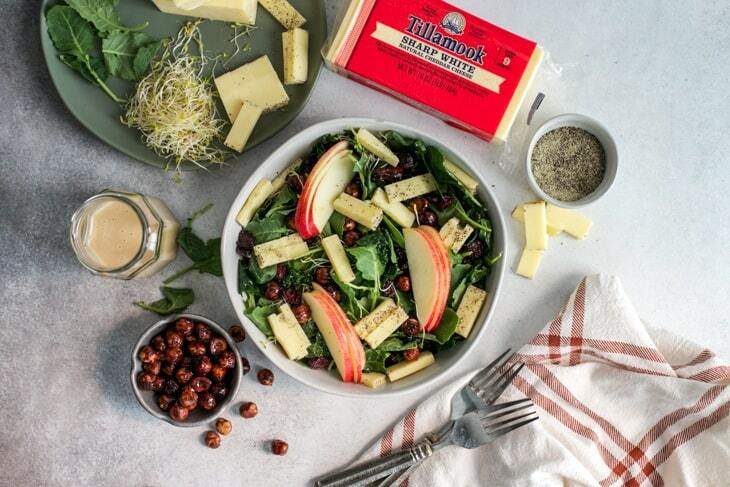 Tillamook Smoked Black Pepper White Cheddar is available in select locations across the country. Find out here, if it’s carried in your local store, or go here to request it! I adored the combination so much I took matters into my own hands. All you need to do is slice 4 ounces off the block of the Sharp White Cheddar Cheese Loaf, roll it around in black pepper, and sliced it up into small pieces. That’s it and OMG it’s so good you guys. Seriously I want my cheese like this all of the time now. Why is cheese so addicting? 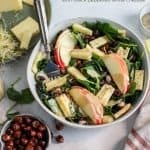 This Northwest inspired salad will for sure be your new favorite. It’s also really good with a peppered turkey deli meat! Lunch on repeat, most definitely. Slice two ounces of Tillamook Sharp White Cheddar Cheese Loaf from block and place on cutting board. Sprinkle black pepper on cutting board and roll slice around until cheese is coated on all sides. Slice into 1/4″ slices/chunks; set aside. Place chopped lacinato kale on cutting board and drizzle extra virgin olive oil; rub kale between fingers giving the leaves a massage (just trust me – it helps take away the bitterness). Combine oiled kale and baby kale in bowl. 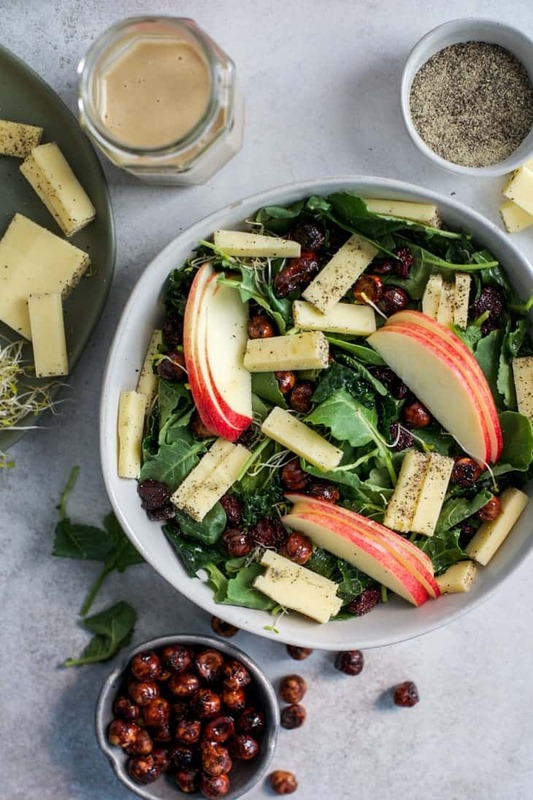 Add honey roasted hazelnuts, dried cherries, apple slices, sprouts and peppered white cheddar cheese slices into bowl of kale; gently toss and serve with dressing of choice. I used this tahini dressing. To prepare fresh hazelnuts, I followed these instructions. To roast peeled hazelnuts: place 1/2 cup dried hazelnuts on lined baking sheet. Drizzle with 1/2 tablespoon olive oil and 1 tablespoon of honey, mix with hands to coat and add dash of salt. Bake at 325ºF for 10-15 minutes, until hazelnuts are golden and fragrant.